U of A students connect with schoolchildren on a previous trip to Belize. University of Arkansas students interested in taking part in the education programs scheduled during the spring Study Abroad trip to Belize are invited to attend an informational meeting from 4:30 to 6 p.m. Monday, Oct. 12, in Room 206 of Peabody Hall. Faculty in the College of Education and Health Professions will lead projects to include teaching literacy skills to local students. The U of A students will also learn about the country's culture and visit historical and cultural places in Belize. They will receive 6 hours of course credit. 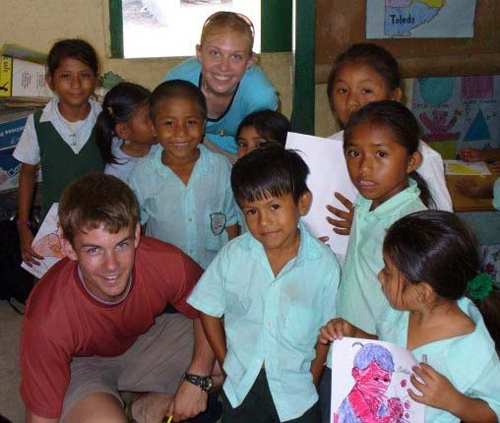 The U of A has led the service-learning project in Belize since 2006. More information is available on the Office of Study Abroad & International Exchange website.